A newest development in the fashion space is Burberry’s collaboration with Twitter. The British luxury house offers users the chance to capture pictures of the Burberry Prorsum Fall Winter 2015 Womenswear show, live from the runway, from anywhere in the world. 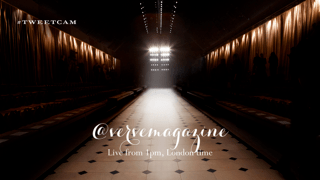 All one needs to do is tweet #Tweetcam to the @Burberry Twitter account, which will trigger a camera to take a photograph from the best vantage point within the show space as the models walk down the runway. Each picture is then personalised with the user’s Twitter handle and a time stamp of the exact moment the image was taken, and then tweeted back to them. This is clearly, one small step for Burberry, but a giant leap for fashionkind.